Gothenburg, Sweden – Riding against some of the best athletes in the world, the U.S. jumping combinations battled their way through Thursday evening’s Longines FEI World Cup Jumping Final I (Jumping Speed Class), the first round of the Longines FEI Jumping World Cup Final at the Gothenburg Horse Show. In the end, two-time World Cup Final champion Beezie Madden placed 10th, leading the way for the U.S. Riding in her 12th World Cup Final, Madden (Cazenovia, N.Y.) and Abigail Wexner’s 13-year-old Dutch Warmblood stallion, Breitling LS, stopped the clock on 60.74 seconds. With just one rail down at the final fence, the combination finished on 63.74 seconds. Fellow American and first in the ring for the U.S., Kelli Cruciotti (Elizabeth, Colo.) and Hadja van Orshof, her 12-year-old Belgian Warmblood mare, knocked just one rail in their World Cup debut. Finishing on a time of 68.76 seconds, they are positioned in the number 19 spot headed into Friday’s round two. Other U.S. combinations saw some difficulty on course but will look to improve their rounds on Friday. 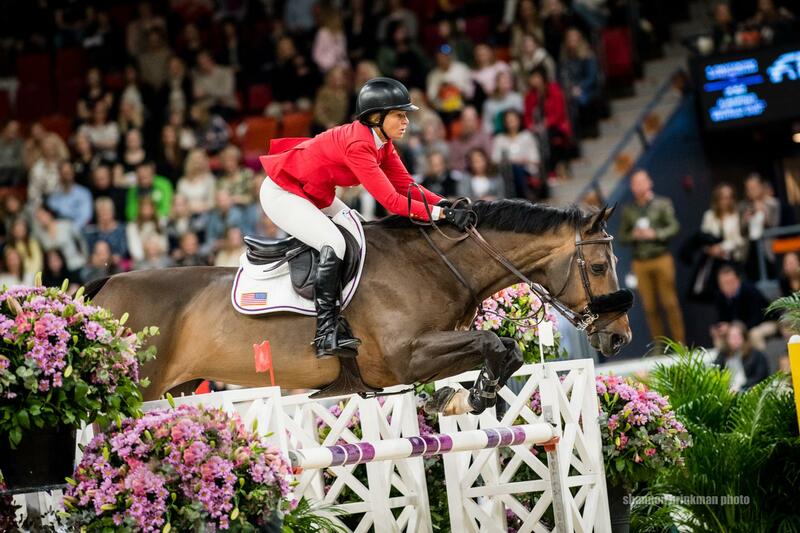 Georgina Bloomberg (New York, N.Y.) and Chameur 137, Purple Road, LLC’s 11-year-old Westphalian gelding, finished on a time of 76.06 seconds, currently sitting 29th. The 2018 World Cup Final runner-up Devin Ryan (Long Valley, N.J.) and Cooper, his 12-year-old Dutch Warmblood gelding, finished on 74.10 seconds and sit in 25th headed into round two. Also in their World Cup Finals debut, Eve Jobs (Los Altos Hills, Calif.) and Venue d’Fees des Hazalles, her 14-year-old Belgian Warmblood mare, finished on 75.41 seconds and currently sit in the 27th position. Jumping continues on Friday with the Longines FEI Jumping World Cup Jumping Final II and culminates with Sunday's Longines FEI Jumping World Cup Jumping Final III, which determines the FEI Jumping World Cup champion. Watch it live on FEI TV beginning at 12:00 p.m. ET on Friday and 8:00 a.m. ET on Sunday.